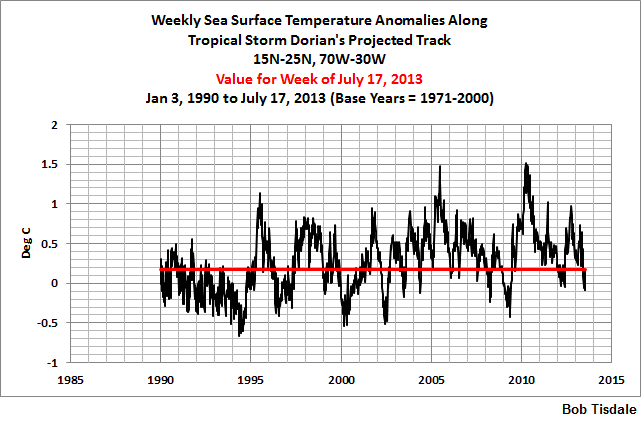 Sea Surface Temperature and Anomalies Along the Projected Track of Tropical Storm Dorian | Watts Up With That? The National Hurricane Center announced the formation of Tropical Storm Dorian. So we’ll take look at the sea surface temperatures and anomalies along its projected storm track. See Figure 1. In it, I’ve also highlighted the coordinates of the region we’re discussing in the anomaly graph in Figure 3. As shown in the left-hand map in Figure 2, last week the sea surface temperatures for much of its projected track were above 26 deg C, which is considered the threshold of hurricane formation. I’ve also included the climatology (the average North Atlantic sea surface temperatures for the period 1971-2000) as a reference in the right-hand map. 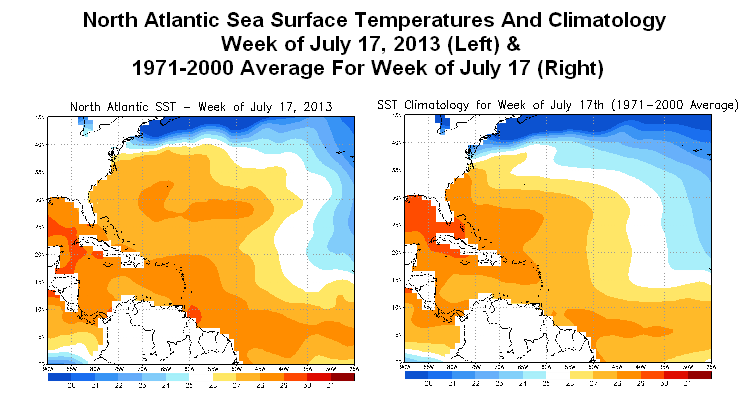 Sea surface temperatures are an important component of hurricane development. Tropical storms need a lot of warm water to grow. The following are two paragraphs from Chapter 4.18 [ENSO Influence on Tropical Cyclones (Hurricanes)] from my book Who Turned on the Heat? The recipe for a tropical cyclone has three primary ingredients. The first is warm water—waters in excess of 26 deg C. Because the tropical storm feeds off the warm water, it cools the sea surface, so the warm water has to reach depths of about 60 meters in order to support the development of the tropical cyclone. The second ingredient is moisture and lots of it. The moisture has to cover a large area and be thick, normally extending from the sea surface to altitudes to 20,000 feet (about 465mb). The third ingredient is relatively light winds. That’s where an El Niño spoils the recipe. An El Niño event in the tropical Pacific causes stronger-than-normal high level westerly winds in the Main Development Region of the tropical North Atlantic, and those strong high level winds can cause wind shear. And as we can see in Figure 3, the weekly sea surface temperature anomalies for the week centered on July 17th were above the average for the period of 1971-2000, but they were not exceptionally warm. That is, they’ve been a whole lot warmer in the past. We’ll just have to see where Dorian decides to go and how strong it becomes. At present, the NHC is showing it remaining as a tropical storm through Tuesday as it nears the Dominican Republic. I wonder who is the lifeless troll who so often rates all posts her one star almost immediately? You can clearly see the decline in activity. We at in the 1970’s literally with all the hippies with computers now though. Is the beginning of all that warm water hiding in the oceans coming to the surface? Should we be scared? The discussion at Weather Undergound shows a fairly rapid forward motion, 16 mph, which tends to impede rapid development and also notes the possibility of much stronger wind shear in a few days, again impeding further development. Just pointing this out as a reminder that while very warm waters are essential for hurricane development, there are other factors involved. OssQss: Thanks for the link. The wind shear is likely to be more important to this storm’s future. Any data on that? This is where the use of computer models actually has validity BUT is subject to sufficient error that uncertainty is still large. Thus, the simulations show how the various weather patterns (ridges of high pressure for steering at low levels and growth at high levels in the atmosphere) (troughs of low pressure to slow and shear the cyclone) will develop and help or hinder the path and development of the storm. Since the 3 and 5 day forecasts are often more right than wrong, there is still hope for GCMs….just not a lot for 50 years out. Perhaps as important, if not more so, will be dry air ahead of Dorian that is now getting mixed into the centre of the storm. Along with the fast westward motion adding to wind shear and the SSTs not being high enough to compensate, I’m expecting Dorian to perhaps fizzle out before Wednesday. The system may well persist, but I’d not be rushing to the timber merchants to board up the windows any time soon. What a remarkably delicately balanced system!!! With the upper atmospheric cold and the warm oceans, scientifically, we have be able to determine that 26C is the minimum temperature for “large storm formation and maintenace. I am not being sarcastic! With all the apparent unpredicabily of weather and storms, this is a fantastic data point! We can all use it to judge if a storm will strengthen or weaken! My wife asks an interesting question. What was the sea surface anomaly for the 3 highest years of hurricane occurrence (that is the 3 that we have some clear sea surface temperature data)? Is there, in fact, a direct correlation between sea surface temperature and hurricane occurrence or do we need to include a multitude of other factors? Being somewhat of a nerdish disposition, I often read the advisories from the NHC, even though I live much too far north to be affected by tropical storms and I am intrigued by how the forecasts change over time. The good thing about the NHC is that you can go back and read all of the discussions for any particular storm and see how accurate they have been. Dorian, for example, is now forecast to be significantly weaker than it forecast yesterday at this time, but this is often reflected in the discussion and reasons for the weakening have been given. My point is that the more general (media broadcast) weather forecasts in North America have succumbed to sensationalism in that they routinely forecast much more extreme conditions than actually occur (hotter, colder, more snow/rain etc.). Furthermore, these forecasts are repeated many times in each bulletin, but actual conditions only once thus giving the viewing public the impression that the weather is hotter/cooler than it actually is. I have not seen this (to my knowledge) in the NHC discussions, but this is just my incomplete observations – does anyone have any feeling that NHC overdoes things? I can see a certain logic in that they (NHC) would prefer to err on the side of stronger forecasts so that people are not taken by surprise, but a long term history of doing this becomes counter-productive as people begin to distrust the prophecies of disaster (now something I regularly hear from friends and colleagues about weather forecasts – although another anecdote I am afraid). Nice report. But Dorian will simply dissipate due dry air aloft and it’s tiny size. Dire Wolf: There are a number of contributing factors. For example, sea surface temperature anomalies in the tropical North Atlantic are warmer during El Nino events, and those warmer-than-normal sea surface temperatures in the tropical North Atlantic are caused by changes in atmospheric circulation that result from the El Nino in the tropical Pacific. However, those changes in atmospheric circulation also cause wind shear in the tropical North Atlantic, which suppresses hurricane formation. I agree with comments of Keith and Rob above, that Dorian will fizzle due to lack of moisture. Storms need to be fed a lot of moist air to remain viable. Even the moist air behind Dorian seems to be drying up. I think the difference for us in Florida is that we depend more on local TV stations to give accurate forecasts because they have a real interest in being correct. 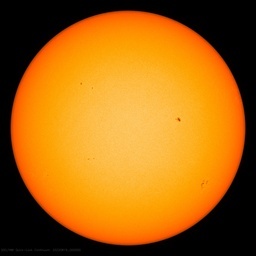 When you find a particular station that is accurate you tend to stay with that station for your updates. So being accurate equates into more viewership for them which means more ad revenue. Now when storms are so far out as currently with Dorian the next 5 days don’t mean much except to be aware that it is there. And I say that because hurricane season prep should already be done by now so it just becomes a matter of the final things you have to do when you know that a hit is more likely. Bob, you may find this imaging helpful too. l spotted this storm brewing on the fulldisk satellite image in the morning on the 24th. Just taken a other look at the satellite image and l expect the storm to quickly weaken. As its beginning to lose its form and is throwing off a lot of lower level cloud cover around it.. It might just be the reduced convection, but it appears from the satellite loops that Dorian may already be starting to open out into a wave. There’s still some rotation there, but compared to Wednesday afternoon it’s starting to look more like a mass of clouds riding the trade winds. It’ll need to reorganise around a low pressure centre soon if it isn’t to degenerate before the weekend is through. Cool ocean, cool atmosphere, and dry flows.. Polar jet intrusion to 35 deg latitude due to blocking lows and their corresponding highs creating massive amounts of wind shear. This will also push it off the coast and north of Florida as a tropical depression. If it makes cat 1 I will be surprised. Florida might get a glancing blow of rain but I dont see this one getting very big. Just looking at the IR footage and this thing is already falling apart. Dorian is dying. As one who detests hysterical hyperbole (TV weather); I congratulate the NWS HC on its professionalism. They call ’em like they see ’em. A new tropical depression will hit the big island of Hawaii east to west.. (the direction is something new) All this as a massive Polar Low affects the Continental US and the majority of temps are 20 degrees BELOW NORMAL.. A September storm in July and grain harvesting is happening in Canada. If the power is behind a cooling atmosphere we are going to get some real cold this winter. Any one else remember that our weather is chaotic at best? Truly amazing times we live in.